My dear pop is no more with me. It's been 3 years he passed away at the age of 72. With Father’s Day is approaching, it's quite tough for me to write on other subjects. So many memories and so much financial learnings are there that I had learned from my father! So much easy yet useful tips that can give you a potential knowledge on finance! Some of them are: a) how Costco membership can be beneficial b) sometimes buying used car can save you big c) frequent dinner out is not good for wallet and health d) importance of contributing money to retirement accounts e) a joint bank account is more valuable than a diamond ring in a relationship f) debt is harmful, there is no concept of good debt or bad debt so on. I was totally a daddy's girl and lucky enough to have a dad whose intense experience, politeness and knowledge have inspired me so much. So, here in memoriam of my dear father I would love to share some of his golden advice that I will follow throughout my life. “Health is wealth”. I heard this line almost thousand times during my teenage. Yes! it's not a financial lesson but these days when medical costs are sky high, Iquite tough to forget all those advices can understand its true value. He always told me your health comes first, you should follow a disciplined life in order to get a well balanced life both financially and physically. During my college days he told me, concentrate on studies now instead of searching a job to earn money. But, don’t just stop thinking about income resources. Try to think how you can earn money and save as well. He said, I’m giving you pocket money not to spend on useless things. Save as much as possible because emergencies are uncertain. So, it's always better to have some money in hand. I learned some basic credit card lesson from my dear father. He taught me how to be extra watchful while choosing a credit card initially. The deal you’re choosing should be a magnificent one. Try to read the terms and conditions thoroughly of the credit card while buying a credit card. Make sure that you don’t forget to check the fees and interest rates on the card. Most importantly don’t surrender to the various free offers. You should control on your temptations to make a wise decision. All of my friends had 4-5 credit cards except me. My father told me to be happy with one single credit card in my wallet. Honestly, I was utterly disappointed when my father declined to give me other attractive credit cards. But with my growing age I learned how important to avoid such attractions. Students need to keep their cards at a minimum point in order to avoid financial disaster. Because each and every financial mistake including credit card debts can affect your credit score negatively. I heard the term “budgeting” from my dad. He used to discuss it with my mom. One day I asked about its function. Then my father gave me a small amount of money and explained how to create split budgeting to spend that money on many purpose. For instance, a certain amount is dedicated for school supplies, snacks, giving etc. He told me it is important for all of us to create a realistic budget to maintain each and every necessary expense. In addition. 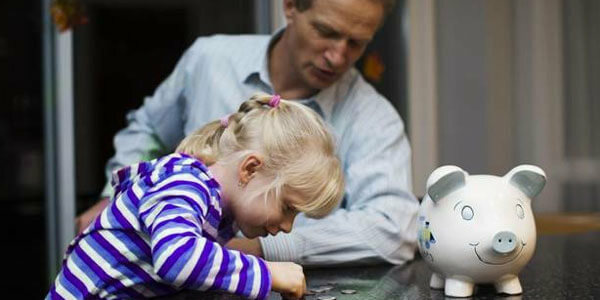 making a budget helps people to track expenditure and monitor savings as well. My dad was quite conservative with his hard earned money. Due to the risk in investment market, he was not a big fan of investment. He always said don’t just throw your money when you don’t have so much knowledge on it. Try to gather knowledge on this subject and take wise step before putting it at stake. Don't just rely on other person’s word. Make sure that you gain bigger returns before trying your luck in investing money. My dad loved to assist those who are less fortunate particularly for the physically handicapped people. He was an enthusiastic volunteer throughout his life and believed in church and other nonprofit organization. And I'm very much a true follower of him, and love volunteering for the people with vision issues. He used to tell me the importance of hard earned money. It takes a lot of effort and hard work to get some money. So, he used to repeatedly tell me not to waste money as it doesn’t grow on trees. And I think twice before purchasing any items till date. He has actually injected some good money habits in me at my initial age. So, it's quite tough to forget all those advice. My Father wonderfully managed my studies, our mortgage, health issues so on. But with all of these responsibilities he decided to take control on spending and make a habit of frugal living. And of course there was a big support from my mom. They decided to become financially stable even after retirement. My dad was happy with his post retired life and even left enough savings for my mom’s well-being. And this is another lesson for me as well. Even I need to manage my earnings following my dad’s footsteps to get a peaceful financial life like him.